A new stone two storey home with a finished basement and three car garage constructed on a corner lot. A large open concept ground floor with 10′ ceilings features an enclosed rear terrace. 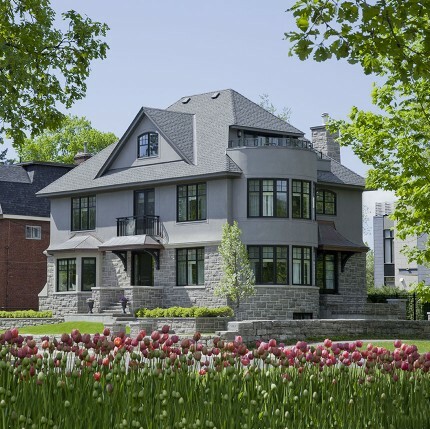 A classic contemporary custom home compatible with neighbouring traditional houses. 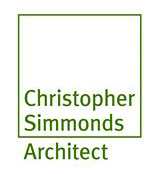 Featuring a steel structure staircase clad with Douglas Fir treads and accented with vertical timber fins and a glass railing. Highlights also include 10′ high barn doors and a secluded outdoor living space. 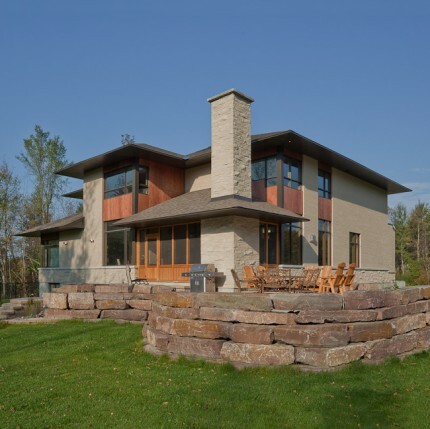 Designed by acclaimed Ottawa architect Barry Hobin. This is an infill house constructed on a severed city lot. It is a raised bungalow with a front den overlooking a park, a large open living room/dining room and a kitchen eating area on the back overlooking trees and greenery. The master bedroom ensuite is also on the ground floor. The basement lower level includes a family room, music room and two bedrooms and an entrance from the two-car garage. This is a modern take on a bungalow providing wide open spaces with large windows and a lot of light. 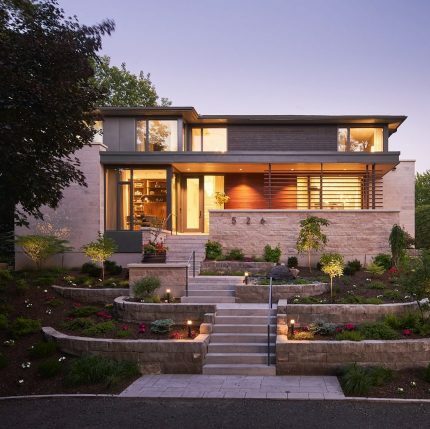 This is a modern take on a traditional two storey stone house with second floor stucco finishes. The stone and the elegant interior finishes combined to provide a modern traditional house. This infill home was built on an empty lot. The open ground floor includes a kitchen / eating area and living room and den. Large pocket doors and barn doors have been used to define areas. It has large open spaces with the feeling of brightness in the house. This modern design two-storey family home that was built on land with very shallow excavation and engineered Styrofoam as a perimeter base around the building. It was built for a young active family. A well landscaped side yard swimming pool and change house with a workshop has completed the design.